Magento 2 has many new features that are beneficial to the web developer and eCommerce business. One of the biggest change is the folder structure. There is a big change in the folder structure which is something that the web developer is more likely to notice. However, the change in folder structure is for the good of the web developers and the overall working of the website (hence eCommerce Business owners). The configuration file is now called config.php thus easier to find. In addition to which the media folder, error folder, skin and JS folders are all located in the PUB folder. The theme folder organization is also different from what it used to be and has been made easier to access and maintain. 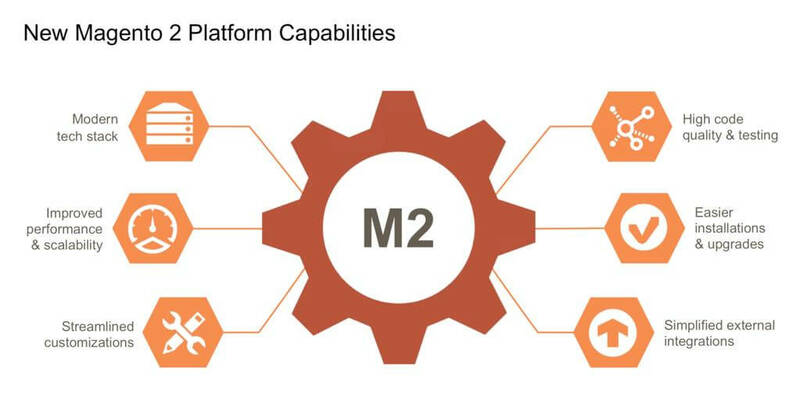 Magento 2 is ready to take on the next wave of highly optimized and feature rich eCommerce Websites. It has been developed to perform much better. Almost all of the development effort on Magento 2 was focused on making it measurably better in every aspect. Magneto 2 offers full page caching, which means it will cache both category and product pages as well as the CMS pages. The caching itself has improved a great deal and is a real performance booster for the website. The major advantage being that the pages are served as if they are static HTML pages when they are dynamic. The cached pages are automatically updated when there is an addition of a product or an existing product is modified. The Magento 2 code base is designed with advanced code structures and encourages the web developer to do the same. There is extensive documentation available on the features and design patterns that have been used to develop the software which can be quite handy. Magento 2 thus has an overall all better code quality and the maintenance is easy as is upgrading it. Magento has several editions available; where the community edition is available as a free download. There are some advanced database features available in Magento 2 Enterprise edition. Database separation is the new and advanced feature in Magento 2 Enterprise edition which has many scalability and load balancing implications for the good. It allows one to maintain multiple databases for the project. For example, there could be one to store the products data and CMS pages, one for the checkout process and one for the order management. Furthermore, each of the three databases can be configured to utilize a slave database for the purpose of load balancing and backup. Magneto 2 also offers a great many new extensions which are a big improvement over the previous version. It has made the payment integration a breeze as well. CSS pre-processor LESS is now available by default thus it is easier to maintain the complex CSS routines in the project. Alakmalak is a firm that has been around since a very long time. They have developed several websites and mobile applications. This includes many eCommerce websites including many developed in Magento. Our web developers have all the resources and state of the art facilities available to them to develop good eCommerce websites. They can help you upgrade or develop a Magento 2 eCommerce website. Our Magento website development services offers a big performance boost, has a simplified administration interface, an optimized code structure, highly optimised database structure, better scaling options and built in CSS pre-processor which enough to convince the toughest objection against upgrading to Magento 2.